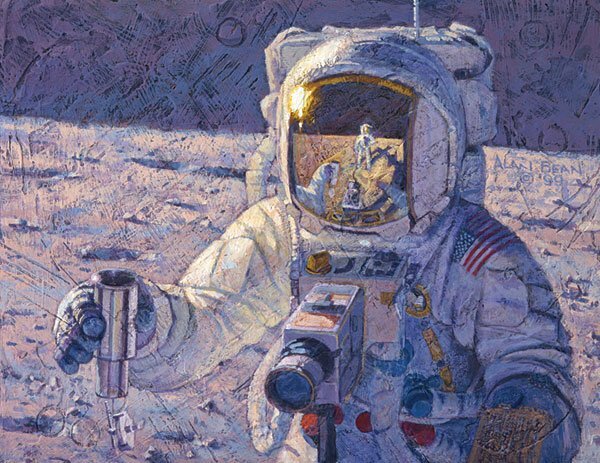 "The scientists on earth were concerned that the lunar samples we would be collecting on the Apollo missions could be tainted by our spacesuit gloves as we picked them up and stored them. They devised a small metal Environmental Sample Container (ESC) and asked us to put small rocks and dirt in it using only our shovel. This allowed us to insure we never contacted that sample with our gloves and that it remained stored in the lunar environment, in pristine condition, until we got home. "Pete had practiced placing dirt and small rocks in The Environmental Sample Container on Earth with the small shovel, while I held it steady. It was a quick and easy task.